We are one week away from the biggest gaming event that the country has seen and we can’t help but feel excited. While Dreamhack celebrates the gamer in all of us, there is a competitive aspect to the event as well other than the BYOC, with teams from outside of the country invited to take part. Over 15 titles are being played out competitively in the BYOC section with the Dota 2 and CS:GO winners moving onto to join the invited teams in the DreamHack India Invitational. Dota 2 and CS:GO are widely considered to be the two most popular esport titles in the country and the organizers have big plans for these two as they feature a much larger prize pool than the rest while also offerring participants a chance to play against some big names. Day 1 (21st December) of the BYOC will see teams competing across two qualifiers and the winners of each qualifier will get a slot at the DreamHack India Invitational in addition to INR 20,000 in prize money. Each qualifier is restricted to 16 teams and will be on a first come first serve basis. Who can play in these qualifiers? The qualifiers are open to any 5 man team who have purchased tickets to the BYOC. Each member will need to have their own BYOC slots. Since there are only 16 teams per qualifier, they will be given on a first come first serve basis. Teams are required to register at the registration desk at the venue. The details for purchasing BYOC tickets can be found below. Do you need to bring my own PC to play in the qualifiers for the DreamHack India Invitational? Yes. Additionally, it is also the responsibility of the team / players to have their own Steam ID with the current version of the game installed on it. Players and teams are required to update the game prior to setting up their PCs in the venue. 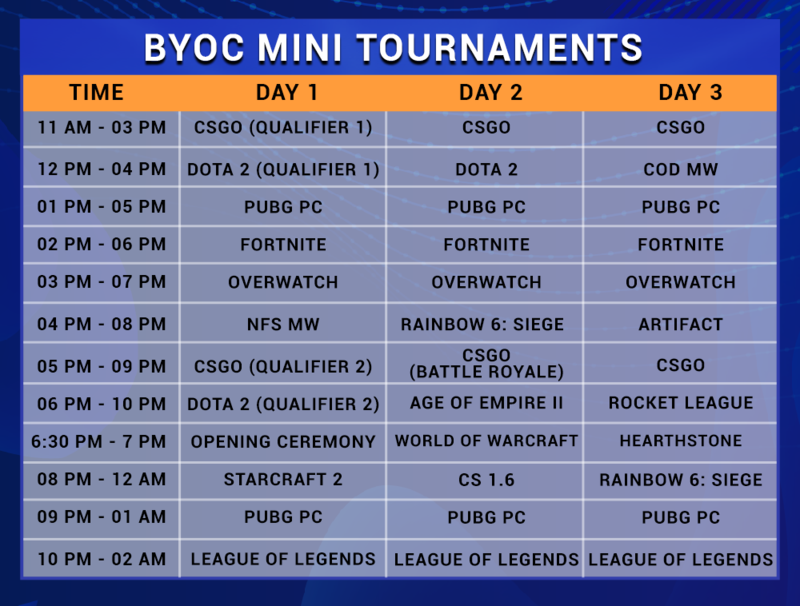 For CS:GO the two teams that qualify via the BYOC qualifiers will then face off against two of South Africa’s top teams, Bravado and Energy Esports while in Dota 2, the teams take on Mineski and Neon Esports, both hailing from SEA. The winner of each qualifier in Dota 2 and CS:GO will receive INR 20,000. For the Invitational the total prize pool for each game is 25 lakh INR/~42,000$. Each of these titles features a prize pool of 20,000 INR each. The breakdown of the prize pool across all titles and games can be found here. Apart from the competitions, fans will also have a chance to meet some known names such as Harvey ‘dsn’ Orvall, Prasad ‘StrykerX’ Parmajothi, Tres ‘stunna’ Saranthus and Chai ‘Mushi’ Yee Fung. Additionally, there will be live music, stand up comedians, cosplay, gaming and tech product stalls, a streamers area, tournaments for the console as well as mobile titles among a host of other activities. How to register and where to buy tickets? Detailed information about the titles/activities/talent and competition can be found on the official DreamHack Mumbai website. Tickets for the event, both visitor passes and BYOC tickets can be purchased from BookMyShow. Visitor Passes are priced starting from INR 499 while BYOC passes are priced starting from INR 2999. More information on tickets and packages can be found here.